If you really believe that God exists, wouldn't you do everything you possibly could to praise and please him. The Bible sure thinks so, yet so many "Christians" take it only half way. They believe what they want to believe, and they ignore what they don't. If they could only step back and see what is going on there, perhaps they would realize the paradox of their beliefs. I cannot count the number of times I have asked the same question. While I have received many answers, none are even remotely satisfactory. This question, and minor variations of it, pose what appears to be an insurmountable obstacle to all Christians except for perhaps the most rabid biblical literalists. Although I have never met anyone who actually lived as if they believed every word in the Christian bible was the literal word of a divine being, I accept the possibility that such people might be out there somewhere. The Secular Thinker draws on his (or her) experience as an atheist attending a Catholic college, noting that it was difficult to distinguish Catholic students from non-Catholics. I know so many people who believe that the God of the Bible (which one?) actually exists, yet they break the 10 Commandments all the time. Honestly, if you believe this all knowing, all powerful, ever present being exists, then shouldn't you be doing everything you can to do what he/she/it says? A common response, one that I have received many times, is that nobody is perfect and that these students cannot be expected to never violate god's laws. But if one really believed that one's eternal soul was in jeopardy, wouldn't one be able to avoid breaking whatever version of the 10 Commandments one was taught? The "nobody's perfect" response does not strike me as a viable one. Observations like these lead many atheists, and more than a few Christians I suspect, to question the sincerity of the beliefs professed by some Christians. Perhaps they do not really believe what they claim to believe and simply maintain the appearance of such beliefs for the sake of the social benefits they confer (e.g., being part of a religious community, etc.). Perhaps they profess the beliefs because they were taught from an early age that this is what they are supposed to believe. Perhaps they try with all their might to convince themselves that they believe these things because doing so carries some sort of emotional benefit. What such individuals describe as a "crisis of faith" may be little more than their rational mind revolting at the incongruence between their claimed beliefs and their behavior. What it boils down to for me, again and again, is that the overwhelming majority of those who call themselves Christians do not behave as if their souls were at risk. 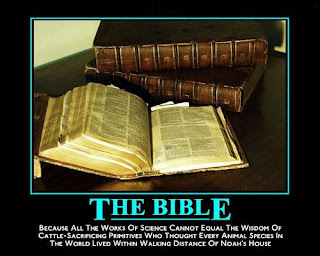 Few even seem to have a clear idea of what their bible says. The funny (or sad) thing is that the last time I posted something along these lines, it was picked up and linked at a Christian blog. The blogger expressed agreement and joined me in lamenting the problem of "fake Christians," evidently missing the point entirely. It seems to me that a real Christian would have to be one who wholeheartedly rejected the arrogance associated with attempting to interpret the meaning of his or her "holy" scripture and instead lived as if every word of it was true.